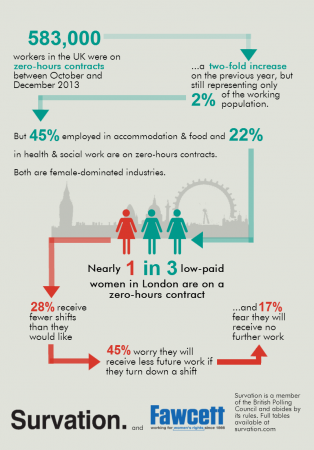 A survey conducted by Survation for the Fawcett Society looks at women on low-paid zero hours contracts. A new poll of low-paid women has found that 14% are on a zero hours contract – defined as a contract that requires the worker to be available for work whenever required by the employer, even when there is no guarantee that any work will be provided to them. This figure is almost a third among low-paid women in London. The results suggest that low pay and zero hours contracts may go hand in hand. In February, our poll of people in employment found that 5% were on zero hours contracts. Women on low pay are therefore almost three times as likely to be on such an unpredictable contract than the workforce as a whole. We asked respondents the main reason for them being on zero hours contracts. Only a quarter said they wanted such a contract. 40% said it was the only work they could find. We also asked women on low-paid zero hours contracts whether the shifts/hours they get are more or less than they would like. Over half (52%) said the number of shifts/hours they get is ‘about right’, 20% get more than they want and 28% get less than they want. Worryingly, 61% of women on low-paid zero hours contracts feel that if they turn down a shift, either they may be less likely to be offered further shifts or they may be offered no further work at all. “Zero-hours contracts provide the ultimate flexibility for employers, but our research shows that this comes at a cost to some of the most vulnerable workers – those on low pay. “Low paid women in London seem to be bearing the brunt with nearly 1 in 3 on a zero-hours contract compared to 1 in 8 in the UK as whole. 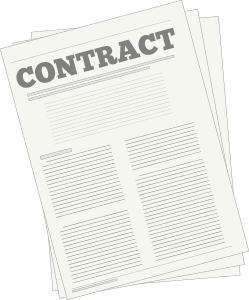 Most are not choosing to work this way – they either can’t find any other work or feel under pressure from employers or Job Centres to accept these types of contracts. “With zero-hours contracts there is no guarantee of work at all, so this can be a route into financial insecurity and hardship. The women in our sample were all earning below £7.44 per hour. Yet, even 28 per cent were not getting as many shifts as they would ideally like. From 4th-6th June 2014, Survation surveyed 1003 women paid £7.44 or less per hour. Data tables can be found here.